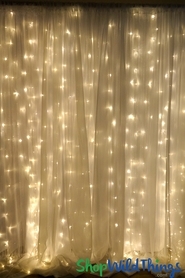 An essential tool for every wedding and event planner, poly premier fabric panels have proven to save many an event by providing much needed coverage while delivering a clean, stylish look. 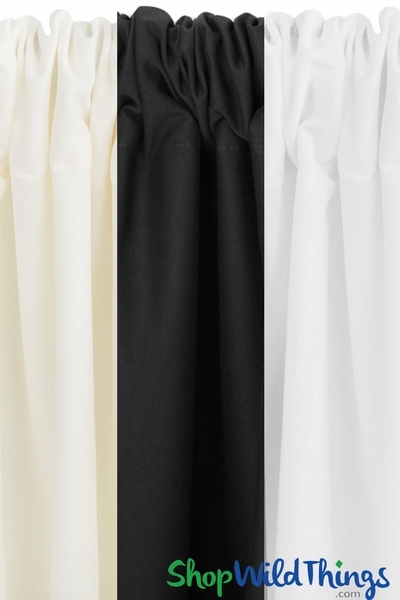 Inherently Flame Resistant, our professional grade polyester drapes are a true wonder when you need to conceal a background, hide unsightly areas or simple need to add a professional yet elegant finishing touch to the room. Choose from Ivory, White or Black. Each panel is 60" wide by 94" long and comes with a 4" rod pocket on BOTH the top and bottom of the 94" long side. 100% polyester but with the look and feel of linen, poly premier fabric drapes are very durable yet have a high-class, refined appearance. The flat matte finish makes them popular for weddings and events, trade shows, stage & theatre productions, night clubs & restaurants or to use as photo backdrops. In a pinch, this can also be used as a tablecloth or to cover the front of a table. Wrinkle-free and easy to clean, these panels are a dream to work with! 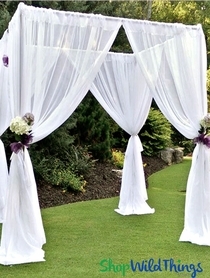 Make a pop-up kiosk or gazebo using Pipe & Drape Hardware Kits and for retail displays and marketing campaigns, these panels really dress up hanging overhead frames. With 2 rod pockets, you can hang this vertically and secure the bottom if need be or if your application allows, ruche or gather the material at the top, the bottom or the middle for a distinctive look. Equally attractive from both sides, hang this durable drape on a traditional rod, a tension rod, wire or use magnets to secure over a metal door threshold. Drape or hang from the metal framework in drop ceilings with these powerful Magnet Hooks. The dual pockets also allow you to flip over the curtain, to alternate it with every use which will prolong the life of the pockets! This also makes it handy when you're assembling. Whichever end you have in your hand is correct! Our poly fabric panels are Inherently Flame Resistant (I.F.R.) Pass NFPA 701, CA Title 19 Small Scale, CAN NFPA 705 and CAN/ULC-S109-14.